The ø40cm LED lamp is in a rotomoulded polyethylene. It is a splash and shock resistant material. Anti-UV treated. 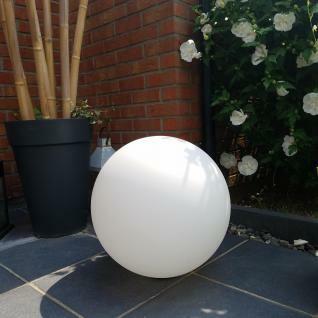 Designed to meet standard IP65 which makes it waterproof, the light ball can safely remain in a swimming pool or a source of water. LiPo 3.7V, 2400mAh battery. It reaches a full charge in 4-6 hours for 8-12 hours of use. The multicoloured light charges by induction. Just put it on its base.